Polenta might sound like some exotic food from a far away land but, simply put, it’s cornmeal porridge. 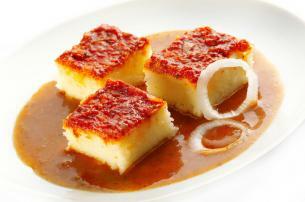 Polenta is popular throughout Europe (especially in Northern Italy, where it even tops pasta) and Mexico. Polenta is a gluten-free, multi-purpose food that’s a breeze to make – just mix white or yellow cornmeal with a little water on the stove top, and you’ve got the basics. If you don’t want to make it from scratch, there’s an instant version that you can whip up in minutes, much like oatmeal. Polenta is also sold already prepared in tubes – you can slice off rounds, then grill or bake it. If you make it from scratch, leave it in its sauce-like state and use it to top a steak, or lay a piece of fish on top. Other options are baking or grilling; after an overnight chilling in your fridge, polenta will harden and you can cut it into squares. Next, bake it in the oven or grill it to serve as a side dish that is sort of like a fluffy cornbread. It serves as a wonderful bed for lots of different foods, including mushrooms. Another option is using it as a base for a sausage and cheese casserole. I’ve even eaten this versatile stuff fried, or baked into quiche-style pie. Readers living in the southern U.S. might find that polenta is starting to sound familiar – it’s very similar to grits. The two have virtually the same flavor and are prepared in pretty much the same way (except grits are made strictly with white corn). My favorite accompaniment for either grits or polenta is cheese. A dash of hot sauce doesn’t hurt, either. Never microwave polenta — it just doesn’t taste as good as when it’s made on the stove top. I don’t recommend reheating polenta and cooking it a second time — it’s not one of those foods that tastes as good the second time around. Serve and eat polenta the minute it’s finished cooking, because it’s not as good if it sits around. Give polenta a shot, and let us know what interesting recipes you come up with! Great post! I’ve fallen in love with polenta, and it has replaced pasta in my meals. I usually buy the tubes of polenta at Trader Joe’s, cut them into slices, put in a baking dish, cover with pasta sauce, and cook in the oven for about 15 minutes at 350 or so. It’s delicious! Thanks Chavi for sharing your recipe! Cooking doesn’t get any easier! Hello, Cool Idea. I just made polenta a few days ago with Gorgonzola cheese and heavy cream. It was pretty darn good so if you have time come check it out and let me know what you think. Hey Joe! Your polenta looks delicious and easy! The only hard part is stirring for 30 minutes! I’ve enjoyed this little gem a lot lately. I love to slice it then heat it up in a bit of olive oil. Top them with a marinara sauce and mozzarella cheese. Just put it under the boiler for a few moments to melt the cheese. Quick and easy! Thanks for the quick recipe. The great thing about this recipe is that all the ingredients can be bought ahead of time. We enjoy Trader Joe’s polenta as well for breakfast. Fry the polenta, fry a couple slices of tomato and an egg. While cooking season with salt, pepper and oregano and enjoy. What a great idea! I will have to give it a try.